When looking for which ports Exchange 2010 uses, you probably already read the excellent Exchange 2010 Network Port Reference TechNet article located here. Note that it’s a v1 and not all things are included, e.g. For Hub-Hub, CAS-CAS or Edge-Edge, I’ve included a 2nd Hub/CAS/Edge server only mentioning ports used for Hub-Hub, CAS-CAS and Edge-Edge communications. Also, all ports are left at their default values and the diagram doesn’t reflect the fact that you can fix certain ports like the one for the DAG or the MAPI RPC port; that might be added in a later version. When you got feedback, fill in a comment. Otherwise, feel free the use it; crediting or a reference would be nice. This entry was posted in Exchange 2010 and tagged Design, Exchange, Planning by Michel de Rooij. Bookmark the permalink. Great diagram! Would it be possible to also publish this as a PDF file? Yes, but first I’ll process initial feedback and add client elements. This is a helpfull peace of work. Great post Michel, I appreciate the effort that has gone into this. I love it. Thanks a lot Michel. Very nice! Do you have the diagram that includes Outlook clients to the CAS as well? Not yet, will work on full blown diagram asap. The arrows to/from the DC and mailbox show as two way for protocol communication I’m guessing that this was just a slight oversight? Also, I’m making a tabular spreadsheet of all the protocol communication requirements for a exchange 2010 environment. I’ll use this table as the data for a script which will take all the servers in an environment and spit out firewall requests for companies with an international or highly segmented network. Would you be so kind as to review the excel sheet I come up with for additions/mistakes and your professional insight? Oversight? No. There’s two-way traffic, e.g. * Failover Cluster updating its record in DNS. Good point! Thanks for the clarification. I’ll update my list and shoot it out to you soon. Do you have a link to the updated diagram? Port 443 from outside to CAS? Directly (unlikely) or indirectly – e.g. through reverse proxy – yes. 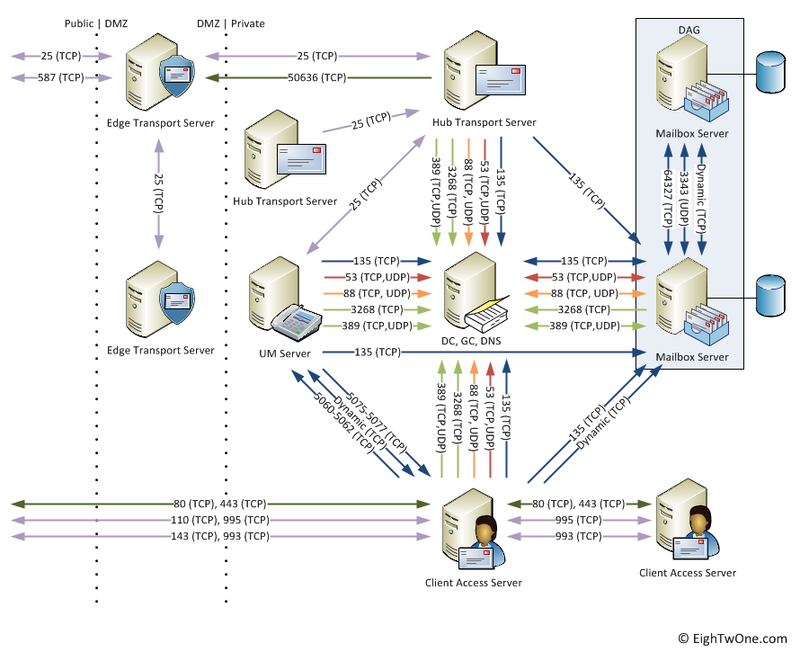 Michel, would you happen to have an update to your ports diagram for Exchange 2013? No and if there will be one it will be low priority as MS advocates unfiltered traffic between Exchange 2013 nodes. Diagram is good but need some improvement as remote site server port?